The best of two worlds. 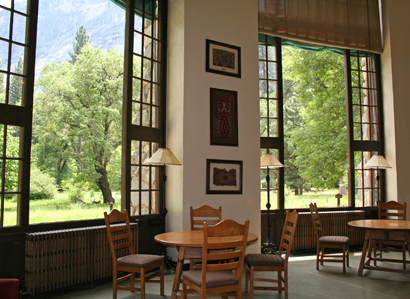 You can spy on the great outdoors from the comfort of a solarium at the back of the Ahwahnee. In fact, nearly every square foot of the palacial digs (not counting the actual rooms) is open to the public. If you're up on California history, you probably know about the explorers who got their facts wrong after speaking with some Paiute Indians one day. When the explorers heard the word "Yosemite", they assumed it was the name of the tribe occupying the real estate with the waterfalls and towering granite rocks. In reality, Yosemite translates as "the killers", a pejorative term attached to a rival group with whom the Paiute and the Miwok were fighting over territory. The Ahwahneechee, or "the people of the Ahwahnee", were the indians wholived in the valley. In fact, their ancestors date so far back that their legends recall the time when a lake occupied the valley. Geologists think that was just after the last ice age ended. That's a pretty strong argument to suggest the nation's first wilderness area set aside by Lincoln in 1864 should have been called Ahwahnee National Park. At least N.P.S. got the name right when it came time to build a four-star hotel. Checking it out before checking in. The photo to the left was taken in 2006 by someone else from way up at Glacier Point. 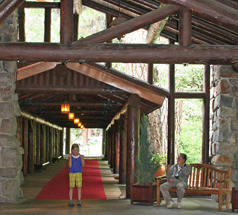 To the right, notice the red carpet that streches the length from the curb outside to the hotel's entrance lobby. Doesn't really fit with the log cabin esthetic, but don't worry, the interior design gets better as you explore further inside. Normally, I wouldn't waste my time wandering around a 4-star magnet for the world's rich and lazy - especially when there's so many other epiphanies to experience in this remarkable stretch of earth. But I'd read an anecdote about Eleanor Roosevelt's visit to the hotel in 1934 with her close chum Lorena Hickok, so the digs peeked my curiosity. Back in those days, of course, the country was deep into the Great Depression. Hickok worked for the Federal Emergency Relief Administration, driving around the country and sizing up the aid dispersement operation. She wrote letters back to the White House, pressing Eleanor's husband to create more jobs, since almost nobody she'd spoken with liked being on the relief rolls. Drinks, appetizers and pine needles. 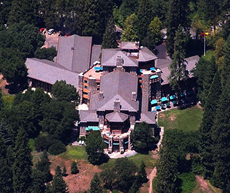 The hotel may look like a long wood and rock structure, but that's just an illusion. The brown siding is concrete painted to match the color of that tree. And the beams sticking out below the room are steel, not timber. The trick was to use paint that matched the color of that tree. Here's something else that will interest you. 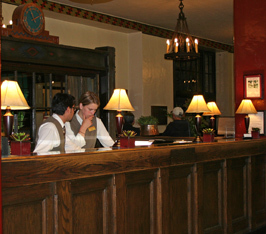 The Ahwahnee Hotel has quite a few Bay Area connections. N.P.S. Superintendent Stephen Mather chose Donald Tresidder - a future president of Stanford University - to oversee the initial construction. 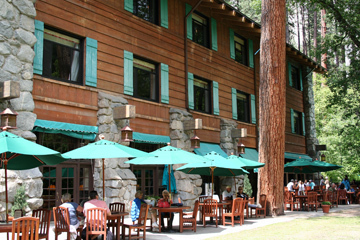 (At the time, Tressider ran Yosemite Park and Curry Company.) Gilbert Stanley Underwood, architect for the Union Pacific Railroad, was picked to design the building. The photographer Ansel Adams was also brought on board, as well as two Persian art scholars and designers, Phyllis Ackerman and Arthur Upham Pope of San Francisco, who outfitted all the interiors. The best-laid plans. The cost of building the most famous public trust hotel in America was estimated at $800,000, but the final bill was $1.25 million. 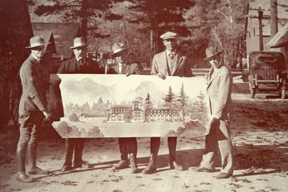 The Ahwahnee opened its doors in July 1927. Pope was an acoustical consultant for the S.F. Opera at the time. He and Ackerman spent $100,000 on the furnishings, including the acquisition of many exquisite hand-woven Iranian rugs and a lesser amount of Native American artwork. Decades later, those prize carpets were lifted off the floors and hung on the walls. Conversely, some of the indian craft work and smaller art objects left the hotel on the night of the opening gala, never to be seen again. Another Bay Area resident, Jeannette Dyer Spencer, was hired as a resident artist in Yosemite. 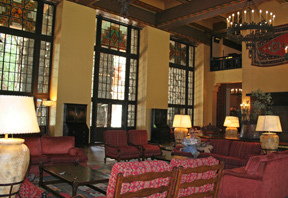 The Louvre-educated glass painter adapted patterns from Indian baskets and weavings to create the stained panels in the upper windows of the grand lounge.